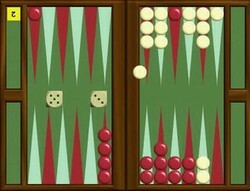 Backgammon is considered as the oldest board game, which involves two people trying to transfer their 15 chips across the game board. The main goal in playing the game is to move all your chips from the game board into the winning pile. This means that you should first place all the checkers into the board and move along the score of the dice. The method of removing the chips from the game board is known as bearing-off. The winner is declared if the player has successfully performed the bear-off before the opponent does. In order to start the game, the players should first decide which one goes first. This is done by throwing the dice and the player who can get the higher number begins the game. In the event that the players get the same number, they will repeat the method until the score differs. The first player will depend on the score of the dice for the number of moves to do. Each player can have the option of using both dice to move a single chip or divide the number shown for two separate chips. After the first turn, it is now the second player’s turn to throw the dice and move the chips. If in case a player rolls a double (both dice have the same number), he or she can play this certain number for four separate times. It is also required that every player will play both dice scores accordingly. However, if only one dice score can be played, then the player should only move the appropriate number. On the other hand, if none of the dice scores can be played, the turn will be given to the other player. A point that is filled up by a single chip is known as a blot. If the opponent’s chip settles on a blot, this certain blot is being hit and the chip that is on it will be transferred on the bar. The player will have to move the chips on the bar into the home board of the opponent. The chip will be entered into an available point depending on the score of the dice. Once the player has moved all his or her 15 chips into the home board, then the bearing-off can now begin. Bearing-off will correspond on the score of the dice. Once the chip that is ready for the bear-off is hit, the process of entering the chip will then be repeated. Playing backgammon is easy and fun; however, it requires full understanding of the game as well as wise strategies in order to win it easily. Great tutorial, now I can teach my daughters, backgammon is a great game. I'm working on a wizz I'd love to link to this. Will let you know when I finish it. Great article, gotta share as I can imagine a lot of people would like to learn the game. I love backgammon. It's a combination of skill and luck in equal measure I think.